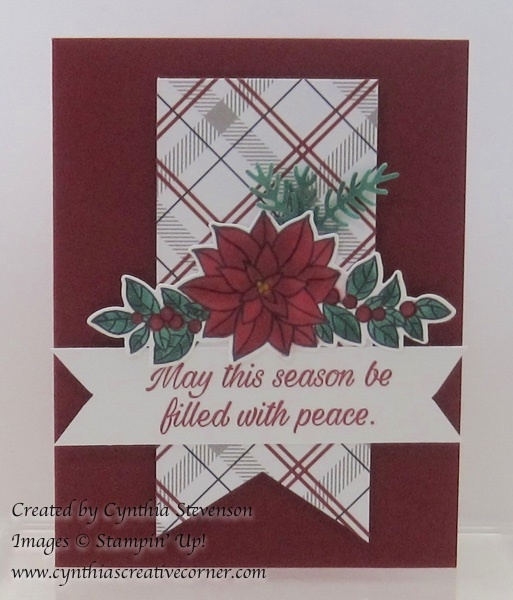 PEACEFUL POINSETTIA BUNDLE FROM STAMPIN’ UP! Happy Monday and welcome to another Peaceful Poinsettia post! I love this set and just had a share this card with you today. There are many different ways to use this set and I paired that poinsettia and leaves with a piece from the Festive Farmhouse designer series paper package. Cherry Cobbler is a great card base to set off that lovely image, don’t you think? The Banner Triple Punch was put to good use here and is a great addition to your stamping supplies! Have you signed up for Christmas card classes yet? Today’s card is just one in the line-up that we will be creating. Here’s the LINK to my Class Calendar. Don’t wait, these classes are filling up quickly!